Determining the best ways to find water, draw it and use it to water or irrigate market-gardens or kitchen-gardens created in villages and most often collectively managed. This factsheet completes the previous and more general factsheet E50 “How to create and manage them ?” that we also recommend referring to. 2) Who use these means and since when ? Everyone who produces market crops or gardens, whether for individual or collective use, and this since the beginning of time. Because water is most often scarce although the quantities needed are sometimes great and because water is essential and one of the main factors of success… and of failure. A number of attempts to create such crop areas or kitchen-gardens have unfortunately failed for lack of sufficient watering or affordable watering or even because of an unexpected loss of supply even for just a few weeks. This can be overcome by building a small storage tank, despite any irregularity in resource availability in a given region. Most often families, groups, communities or schools in rural locations, but sometimes also around cities. a) What are the main water supply sources and what effects does this have ? The easiest way to success in watering is of course to have sufficient piping, rivers, waterways, ponds, lakes or rain water tank capacity available close by, and yet the latter method is one often ignored (refer to Factsheet E4 “Rain water recovery”) or the presence of a spring (refer to Factsheet E2 “Various technologies for water catchment and spring arrangement ?”). It is however often necessary to dig wells or drill for water which is of course far more costly, except if the water level is just a few metres below the surface. The kind of water point available also adds constraints, whether in terms of sufficient and easy water availability, or in terms of carrying the water and time spent, if the water point is a distant one. Even a shallow well, or one with a depth of thirty metres will only allow irrigating less than 100 sq. metres of crops. To cover a larger area, it will then be necessary to dig more than one well or to complement them with other means. 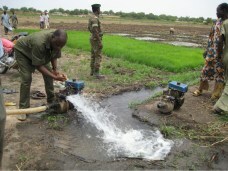 The kind of water point available can therefore limit or even inhibit some crops. Consequently, regardless of the size of the garden, the depth of the water point and its distance from the garden are important parameters for they especially determine the cost of pumping and transport. These limits have been summed up in the table below by PS Eau (the Paris Water Solidarity Programme) in an excerpt from their very interesting Guide to Market-Gardening (see the link at the end of this Factsheet). Nevertheless, it should also be restated that whatever the size of the market-garden and the kind of water resources, the garden will only be sustainable and the investment worthwhile if the investment in both money and labour, is less than the sum of products produced, whether consumed or sold. 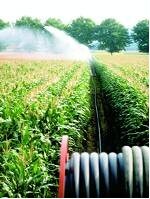 b) What irrigation method should be preferred ? 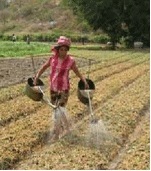 Watering by hand comprises bringing water to plants using watering cans. 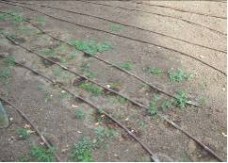 This low cost technique is well suited to small surfaces and even medium surfaces as well as to gardens with only limited water resources but it requires significant labour input and leads to considerable fatigue. This is because we consider that one man working full time can water a maximum of 500 sq. meters of crop area. In this case it is also preferable to set up small storage ponds. To make watering easier, we recommend splitting the garden into one to two metre wide plots separated by planks or small passageways. Gravity based systems assume that a fairly abundant water source is available nearby. 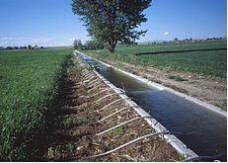 - “Furrow” irrigation : Where water runs into furrows, cuts or channels of 0.6 to 1.25 m, with the ground levelled (slope of some 0.2 to 3%). This very widespread method in some areas, requires plenty of water due to water loss and major land preparation but it does allow easy irrigation of large areas. - Drip watering is a localised system that is highly efficient. It requires running small diameter flexible piping along crops that are pierced at regular intervals or programmable to match the location of plants and running low pressure water through the pipes at certain times of day. This technique which is very economical in labour and water does however require a high degree of technicity on the part of users and very significant investments, reserving it mainly for large scale crop growers. Where trees are grown, prefer a micro-jet approach. c) What means for drawing water ? 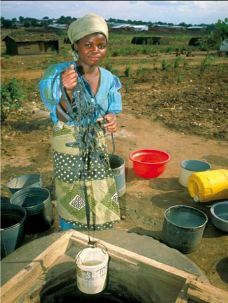 With only limited resources and a small size garden, the simplest and most cost effective means is to connect to an existing tap or to draw water from a neighbouring well, pond or stream using a bucket or bladder , then use a watering can. Drawing water is however made far easier by using a pump. - A hand pump : You will find detailed specifications for these pumps and their cost in Factsheet E35 “Main type of hand pump. Generalities, Advantages and drawbacks”, Factsheet E36 “How to select and maintain a hand pump ?” and the even more complete Factsheet E37 “Presentation of some usual models of hand pumps”. Among these hand pumps, it is worth pointing one low cost model (costing some thirty Euros, sometimes less) that is more and more often used in some countries : the Rope Pump (Refer to the drawing and Factsheet E38 “The rope pumps”). - An even lower cost irrigation pump like the Asian “treadle pumps” pumps : Refer to Factsheet E58 “Low-cost pumps (twin treadle pumps) for irrigation of fields”. 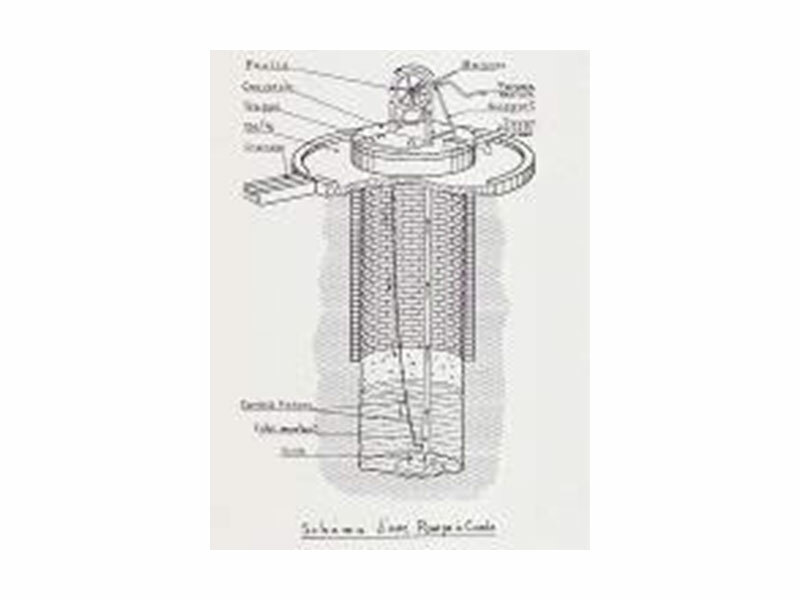 - A small windmill pump : Refer to Factsheet E42 “Wind powered pumps”. - A motor driven pump using gasoline or electricity or most often, a diesel powered pump which is often the handiest and most widespread. This is however not a very eco-friendly, costly approach, except for the smallest models that can now be found fairly easily. Refer to Factsheet E40 “The motor pumps”. There are models suited to all kinds of crops or gardens, some of which cost less than €400 for small surfaces. d) What is the approximate cost of kitchen-gardens depending on their watering equipment ? 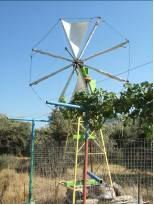 - Only €3 to 400/hectare if fitted only with low-cost or treadle pumps and pipes. 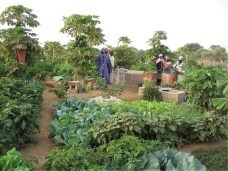 It comprises three parts : bringing in the water, sanitation and gardening. In addition to building a water tower, hand washing facilities at the school, standpipes and 279 cesspools, three market-gardens were created and cultivated by the village women. As not enough well water was available to supply the market-garden, the water point management committee decided to create three dedicated standpipes. As one year later, this water turned out to be too expensive for the women gardeners, the Mayor and the management committee agreed to grant half-price social water. As in the previous case, this programme (digging 24 wells, 40 water drillings, four water tanks and the capture of four springs) comprised a first three parts to treat the water problem’s various technical, sanitary, social, educational and economic dimensions as well as including a sanitation part (building 2,780 latrines after providing hygiene training). It also included the creation of six market-gardens with a total surface area of 12 hectares for use by 48 families in the Tigray Region. The total cost of the water related investments required for completing these gardens (digging four wells, capturing two springs and miscellaneous equipment) came to €9,000. In addition to serving their own needs, the families were able to save money from their sales and to initiate small-scale animal raising, trading and fish farming programmes to generate income so as to alleviate the chronic poverty and food dependency of their communities.